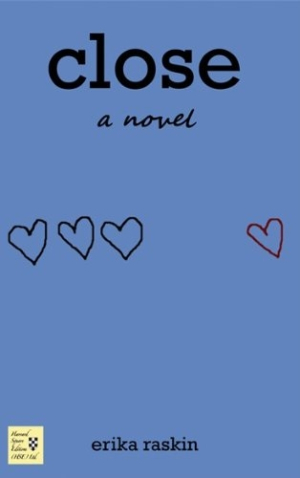 Raskin easily balances humor and drama in this novel about parenting, reality TV, and family. Erika Raskin’s Close is a welcoming and nuanced novel that offers a window into the life of the Marcheson family—with ultimately much of America peering through that window as well. The past was crammed with haphazard snapshots that Kik was sure could be separated into two albums. When My Husband Loved Me. And After He Stopped. Through an unusual crimp of fate, Kik, her daughters, and their father, Owen, end up as the public project of one Dr. Price, famed television therapist and advice guru. Eldest teen daughter Doone lashes out through rebellion and substance abuse, middle teen Casey suffers from the stressful need to be perfect, and the baby of the family, Tess, is an unusually imaginative and challenging five-year-old. Kik’s parenting methods are loving yet sometimes overwhelmed, but Dr. Price feels he can quick-fix this family on his show. Raskin’s narrative skillfully develops characters and uses shifting perspectives between Kik and her two older daughters. Young Tess is especially vivid, and even less-than-sympathetic Owen seems genuine enough to elicit sympathy during a time of intense crisis. The author also excels with details of how a reality TV crew can invade private lives, and how the surreality of the viewing audience can continue to invade emotionally and physically. The hypercritical Internet postings of Dr. Price’s many fans are finely satirized, making one think of the “peanut-crunching crowd” of Sylvia Plath’s Lady Lazarus, full of voyeuristic zeal and swarming to comment on the latest spectacle. Close easily balances humor and drama, and despite the academic setting, the tone is accessible and unaffected. And while the last one hundred pages of plot seem to hasten a bit toward anxious climax and multiple resolutions, Kik and her daughters have become appealing and indeed close enough to make us want to wish them all the very best.